And there is the little clue when I asked myself I wonder how you came across this gem of a novel,an NYRB classic, the place of so many underrated books that get a second chance and so on to become favourites. It’s interesting that you read this now too, after Anna Burns writes of another aspect and era in Northern Ireland, one that may one become a modern classic. This does sound wonderful Jacqui, the nuance of character depicted so well just in the quotes you share, that cathartic effect on the reader, sensing and feeling that overwhelming nature of her anxiety. Love the cover too! Ha, yes – another winner from NYRB! I love how you’ve expressed their raison de etre as a place where so many underrated books (and writers) get a second chance, often introducing them to a whole new audience or readership. They really do know how to curate a terrific selection of books. Also interesting to see how you’ve made a link to Anna Burns and The Milkman, a book that may well spark a resurgence of interest in literature from Northern Ireland. I know that Cathy posted something about this a few weeks ago when the winner of the Booker was announced. There seems to be a lot of exciting work coming out of Ireland these days, both North and South of the border! Lovely review Jacqui and so glad that you loved this novel. I read this some years back when I was new to both Brian Moore and NYRB Classics, and thought it was brilliant, making me want to explore more of his work. I will admit that I was floored by that wonderful book cover too! Another Brian Moore I highly recommend is The Doctor’s Wife, a novel that I think about even today! I think in both these novels he did a great job in the portrayal of the female protagonists when faced with an internal crisis. Yes, that’s it exactly, Radz. His portrayal of the state of mind of a deeply troubled middle-aged woman is very impressive, all the more so for a male writer in his twenties! Many thanks for the recommendations – that’s really helpful as I was beginning to wonder where to go next with Moore if and when the opportunity arises. As you may have seen from the various Twitter conversations this afternoon, The Doctor’s Wife seems to be very highly regraded, so you’re definitely in excellent company there. On the wishlist it goes! Go on, you know you want to! Isn’t it just the most fabulous cover? As soon as I saw this, I knew I had to have it. John Self read a fair chunk of Moore’s novels for his blog at one point and that led me to Catholics, a futuristic novella about a group of isolated Catholic monks trying to hold on to old traditions in a radically modernized (imagined) future church. And here in Canada Black Robe, a historical novel about the meeting of Jesuit missionaries and the Huron (perhaps dated in presentation of Indigenous peoples) was made into a glorious dark film and is always my first association with Moore. But I think he wrote 20 novels. Oh, wow – that’s very helpful, Joe. Many thanks. I’ve seen a fairly recent reissue of Black Robe in the shops over here, so there’s clearly still a level of interest in Moore’s work. Nice to know that he drew on his time in Canada as well as his Irish background. The protagonist does sound terribly sad and lonely. She also sounds well crafted. Boarding houses can make such good settings for fiction. I think that I would like this book. Terrific commentary as always. Yes, incredibly well crafted. On the basis of Judith Hearne, I’m struggling to think of another male writer who seems to have such a deep understanding of the inner life of a troubled woman as Brian Moore. Colm Toibin is probably the nearest, or possibly William Trevor? There must be something about these Irish writers that enables them to capture these woman so accurately and insightfully. It really is very impressive. Brian Moore’s one of those great unsung writers. I read this way back when I was a bookseller and recommended it to lots of customers who’d never come across his writing before. Delighted to see that his work has been taken up by NYRB. Hooray! I’m delighted to hear that you’re a fan of his work. Well, as you can tell, I thought this was just superb, so brilliantly captured down to the finest detail. I bet your customers in the bookshop were thankful for the recommendation! Well, I’d love to tell you I’d made it into a bestseller but the discerning few were pleased. Gorgeous jacket on your edition. That’s the main thing. It’s the quality of a bookseller’s recommendations that make all the difference. And yes, the cover is rather spectacular, isn’t it – so evocative! So good to hear that you already have a copy, Juliana, as I agree it’s right up your street. There’s something about the boarding-house setting that makes it the perfect environment for this type of character study – it must be a magnet for a range of deeply damaged personalities! This might be way too depressing for my current state of mind, but it does sound very, very good and worth reading. I think I will read this together with Milkman, great suggestion by Claire! Definitely an interesting comparison in the making there, Marina — and I’d love to see a post on this from you, although I hear what you’re saying about the bleakness being a potential barrier right now. It really is pretty devastating for Judith, particularly towards the end. You do make this book sound very enticing! I’ve always thought of Moore more as a Canadian writer who happened to have been born elsewhere (as with so many Canadian greats), although reading about this book has made me realize how deep his Northern Irish roots go (pretty sure he was already living in Canada when he wrote it though!) The Luck of Ginger Coffey is another great one (and much more specifically Canadian in its content). Thanks, Nat! It really is a superb book. You know, I only really discovered that Moore had lived in Canada for a number of years when I looked him up on wiki as background for my post – until then I had pictured him as being NI through and through. The book itself definitely feels very rooted in the Northern Irish culture and way of life, so I wonder if it was based on someone that Moore knew? (My mother’s family come from Cork in the south of Ireland, but even so, I’ve heard them talk about women with elements of Judith in their personality. That passage on Sunday teatimes with the O’Neills rings completely true). Many thanks for recommending Ginger Coffey, I shall definitely look that one up! I’m so glad you enjoyed this Jacqui – it’s such a stunning novel. I read it when I was quite young (my Dad was a massive Brian Moore fan) but feel I could get a lot out of rereading it now I’m older. A beautiful review of a beautiful book. Oh, excellent – although I’m sorry you weren’t able t find a modestly priced copy of the NYRB. It really is a spectacularly good cover. At least the writing will be the same quality, irrespective of the edition you select! Thanks, Simon. I’ll take a look at you review of that. Oh, and I meant to add earlier but forgot…Yes, please do share your research on novels featuring boarding house, I’d love to see that. Maybe I could encourage you do do a post on it as I’m sure others would be interested in it too? I suspect someone’s done a dissertation on this topic at some point, far more interesting than my research into making new antibiotics back in my Uni days! Oh I should like this one! Great review. Thank you! I really hope you like it. As bleak as this book sounds, I’m attracted to novels with aging spinster protagonists so have just ordered a used copy with that lovely cover. Fabulous! I very much doubt you’ll be disappointed, Grier, particularly given your tastes in literature. I do hope you enjoy. This sounds absolutely wonderful. I can just imagine the achingly sad nature of the story. I shall look forward to reading this soon – I just bought a copy. I loved this book. I also saw the film years ago with Bob Hoskins and Maggie Smith. May I recommend The Feast of Lupercal as a good follow up; I thought of it as a book about a ‘male Judith Hearne’. Oh, and many thanks for the recommendation – a male version of Judith sounds great! I can understand why, especially given his success in your territory! Many thanks for suggesting Ginger Coffey – I’ll definitely take a look. I’ve been meaning to read this for years. Sounds like Olivia Manning, only sadder. It is a terrible thing to say, but I have never read Moore, even though, as a young bookseller, I was lucky enough to have dinner with Moore and his wife (they were touring for his novel set in Haiti, I forget the name). I had no business being there, but they were so lovely and kind. Oh, wow – what a lovely thing to have experienced, and so good to hear that they were generous with their time. That’s wonderful. I know I shouldn’t say this, but you have to read this, Dorian. It really is very, very good. Olivia Manning is a touchstone for sure — but for me, the writers that immediately come to mind are Elizabeth Taylor, William Trevor and Colm Toibin. 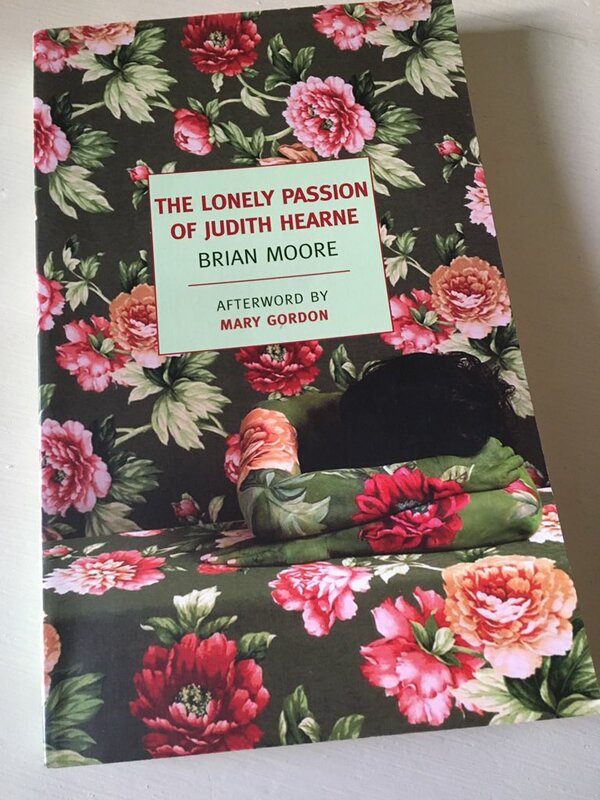 Moore writes with real insight and compassion about loneliness and isolation, capturing so perfectly the emotional crisis Judith is experiencing here. A brilliant and devastating book – just superb. Sold! Moving it up the queue. Marvellous! Let me know how it goes, I’d love to hear. All this and in one of those yummy NYRB editions as well! I’ve been telling myself for decades I ought to read some Brian Moore and never quite getting round to it, as so often happens. Your review may have pushed me over the edge . . .
Hm. I haven’t seen the movie, but I see Janet Maslin of the NYT disliked it so it’s definitely worth checking out. But this sounds like an instance in which I’d prefer to read the book first. The trouble is, as always: When? Crashing this conversation to say that this comment made me laugh out loud! I don’t mind Maslin so much, but there are other critics I feel just the same way about. (Anthony Lane, say.) And that last question rings so true! My life is really getting in the way of my reading! Me too, and I don’t even know who Janet Maslin is! The legendary Philip French (of The Observer) was one of my favourites. I had the pleasure of seeing him at the BFI a few years ago, selecting and discussing clips from some of his favourite films, Sadly he died only a year or so after retiring, a massive loss to filmmakers, filmgoers and fellow critics alike. I rated French pretty highly too. I was sorry to see him go. The critics with whom one habitually disagrees are actually quite useful — almost as useful as the reviewers one trusts. It’s the reviewers who don’t present an argument for their views who’re the real menace. Very true on both counts. There are times when I find Mark Kermode too heavily wedded to his own opinion of a film, unwilling to listen to other perspectives however solidly supported they happen to be. Yeah, his ‘I’m right, you’re wrong’ type of attitude does annoy me. Nice to make someone laugh for the right reasons, for once . . .
See, you just did it again! It’s years since I read this, but it has stayed with me ever since. Poor Judith. How many women there must have been in the 1950s, having done their “duty” to elderly relatives and then left alone to live in poverty and quiet desperation. It’s such a wonderfully written book, and it’s definitely on my Best 100 Novels list. I’m glad you liked it. This sounds so wonderful! I’ve had it on my shelf for a long time – seven or eight years – though sadly in a much less attractive edition. I am very tempted to discard all my current reading and pick this up, as it sounds so perfectly up my street. It’s totally brilliant, and I think you’ll like it a LOT! I’m still marvelling at Moore’s ability to get inside the head of a deeply distressed woman with so much insight, nuance and accuracy. It really is quite an achievement for a young (male) writer, very impressive indeed. I remember reading this and other books by Brian Moore from the library when I was still at school. You have me thinking that I really should start looking for copies and read them again. Oh, how lovely that you discovered Moore at such a young age. I feel terribly late to the party now that my schooldays are very much in the dim and distant past! Still, better late than never as they say. As for reading him again a little later in life, I think that’s a fine idea. On the strength of the characterisation here alone, I’d say he’s definitely worth revisiting even if it’s just to refresh your memory. It’s outstanding, isn’t it? I think it made my best of list last year or the year before. I still remmeber her looking at her shoes and finding solace in the little buttons or something. What a treagic character. I read Black Robe. Very different. I think Lizzy has him among her “completist” projects. So there should be many reviews on her site. Now I’m off to write an email. Absolutely brilliant. Yes, the buttons on her shoes! It’s funny how little details like that serve to highlight the narrowness of Judith’s life – tragic is the word, for sure. So much of this book reminds me of one or two of the women my mother and aunt used to talk about back home. (They came from Ireland – the south rather than the north – but still, so many things about these characters ring true, particularly their inner thoughts and the dialogue between them.) Thanks for tip about Lizzy’s site. I must take a look at her Moore archive at some point – it’s good to know she’s a fan. Oh, and thank you for your lovely email earlier today. I’ll probably reply at the weekend if that’s okay, once I have a little more time. Of course. Whenever you’ve got time. About Moore – you’ll be surprised to see how diverse he is. That said, this book is quite unique. In some ways I was gladI started with Black Robe because the other way around I might have been disappointed, even though it’s very good but so different. So it seems! You know, I had very little appreciation of the diversity of Moore’s work until the responses to this post started to come in. It’s very useful to know as I’ll need to chose carefully when the time comes to look at some of his others. Lots of people seem to favour The Doctor’s Wife and The Luck of Ginger Coffey, so they’re definitely on the shortlist. From what I know of it, Black Robe does sound very, very different! Black Robe was s very different but Catholicism is so important in it. Another facet of Catholicism, so it ties in well with the rest of his work. I don’t think I could take this! I can totally understand that! It is pretty bleak, but beautifully captured. As I was reading your review ‘devastating’ was the word that sprang to mind and then you used it in your final paragraph! It sounds desperately sad, but so well written. Yes, absolutely. Devastating is the word, particularly wrt developments towards the end. It really does leave the reader in little doubt as to the desperation of Judith’s situation. Yes, definitely – they make great environments for all manner of interesting fiction. I think it’s a combination of the seediness of the settings and the assortment of misfits they tend to attract that makes them so appealing – to me at least! They do. It’s an excellent pretext to put together people who wouldn’t have met. Their only common point is the state of their finances, otherwise they wouldn’t have ended there. Yes, exactly. The impoverished/reduced circumstances are key factors, adding as they do to the tragic nature of the occupants’ lives. Great to see so much love for Brian Moore on here. I also notice that a few of his books are back in print. I read many of his novels years ago (Lies of Silence, The Statement, The Doctor’s Wife…) I wonder if I still have my copies. I suspect his varied output didn’t benefit him in sales. Definitely due a comeback! Isn’t it just! I’ve been bowled over by the response to this post, both here and on Twitter. There’s definitely a lot of love for him amongst the online bookish community. Can you recall if you had a favourite from the novels you read a while ago? Several people have recommended The Doctor’s Wife to me, so I’m sure that must be one of his best. Pingback: Reading Ireland Month Week Two round-up!